Hey, all! I’m so sorry I fell behind in updating S3 of In/Exhale on my site. I’ll be updating regularly until the end of the season over the next few weeks. Catch up with Season 3, or scroll up for ebooks of Seasons 1 & 2 (all available to read for free!) Hit the break to read the latest episode. Preview? : Read the first chapter here. 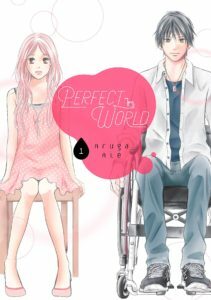 My take: A surprisingly heart-wrenching, realistic exploration of romance with a paraplegic. I’ve been reading a lot of manga lately, because I’ve missed reading so much over the past four years (due to my constant headache), and the advantage of graphic media is there’s less text (and thus less eye strain), yet I can still enjoy stories. I’ve fallen in love with manga in particular because it’s long enough to tell a meaty story and it’s serialized, and I hate having to say good-bye to my favorite characters. So it’s hard to believe that NaNoWriMo (National Novel Writing Month) is almost here. I’ve been thinking lately of reworking last year’s project (Love UnSeen) as my current (unofficial) NaNo project for 2016. I’ve been stuck on this story for months, and I thought about how easily In/Exhale comes to me (relatively; I still do plenty of rewrites and shuffling of scenes there) and thought maybe it was worth rewriting Love UnSeen and posting it on a regular basis (not sure if I could manage weekly, but that would be my goal), then taking your feedback to help me shape the story until I got a first draft finished. The problem is that the blog where I post I/E won’t allow a single author to post on more than one day of the week, and I honestly am not sure if I could manage posting both I/E and Love UnSeen at the same time, especially with having to actually write and format each episode of each story weekly. However, historically I haven’t gotten a lot of feedback here, and I don’t know how helpful the process will be without it. So I’m kinda stuck. I’m also stuck because the current way I post stuff here (via a google docs plugin, that little window you see when you read an I/E chapter here) doesn’t play well with mobile, and I know that nowadays most people actually use their phone/tablet more than their computer. So if I DID post here, I’d have to figure out some way to make it more mobile-friendly, too. Sorta rambling to myself, I guess, but just wanted to give a kinda heads up that these are the things I’ve been working on lately, in addition of course, to continuing to work on I/E as always.